Hatfield, seated second from left, with his family. William Anderson Hatfield (September 9, 1839 – January 6, 1921)—known as Devil Anse Hatfield—was the patriarch of the Hatfield clan during the infamous Hatfield–McCoy feud which has since formed part of American folklore. Devil Anse survived the feud and agreed to end it in 1891. Hatfield was born in western Virginia[clarification needed] (now Logan, West Virginia), the son of Ephraim Hatfield, of English and Swedish descent, and Nancy Vance of Scots-Irish descent. His nickname "Devil Anse" has a variety of supposed origins: it was given to him by his mother; by Randolph McCoy; earned from his bravery during battle in the American Civil War; or as contrast to his good-tempered cousin, Anderson "Preacher Anse" Hatfield. A Southern sympathizer, Hatfield enlisted in the Confederate Army during the Civil War. He was commissioned a First Lieutenant of Cavalry in the Virginia State Line in 1862, a group made to protect the territory along the Kentucky-Virginia border where resident loyalties to the North and South were mixed. The Virginia State Line eventually disbanded in 1863 and Hatfield enlisted as a private in the newly formed 45th Battalion Virginia Infantry, before being appointed first lieutenant and later captain of Company B. His unit spent most of its time patrolling the border area against bushwhackers sympathetic to the Union as well as engaging in guerrilla warfare against Union soldiers. Devil Anse himself has been connected to battles and killings of several Union fighters, including trackers Ax and Fleming Hurley in 1863. Devil Anse and his uncle Jim Vance would later form a Confederate guerrilla fighting unit called the "Logan Wildcats." One of the group's victims was Union General Bill France; killed in revenge for losing one of their members to France's unit. In 1865, he was suspected of having been involved in the murder of his rival Asa Harmon McCoy, who had fought for the Union Army and was waylaid by The Wildcats on his return home. Hatfield had been home ill at the time of the killing, which was probably committed at the instigation of his uncle, Jim Vance. This may have sparked the beginning of the notorious feud between the two families that claimed many lives on both sides. Devil Anse was the patriarch leader during the Hatfield-McCoy feud. His family and Randolph McCoy's fought in one of the bloodiest and most well-known feuds in American history. He was instrumental during the execution of McCoy boys Tolbert, Pharmer and Bud, as well as being present during the Battle of Grapevine Creek before most of his sons and friends were arrested for the murder of the McCoys. Hatfield was baptized on September 23, 1911 in Island Creek by William Dyke "Uncle Dyke" Garrett and converted to Christianity (he had maintained a largely agnostic or anti-institutional view of religion prior to this conversion). He went on to found a Church of Christ congregation in West Virginia. He was an uncle of the eventual Governor of West Virginia, and United States Senator, Henry D. Hatfield. Johnson Hatfield Johnse 1862–1922 Son Most known for his brief affair with Roseanna McCoy. Later married her cousin Nancy McCoy. Hatfield died on Thursday, January 6, 1921 in Stirrat, Logan County, West Virginia at the age of 81 of pneumonia at his home along Island Creek. He is buried in the Hatfield Family Cemetery along West Virginia Route 44 in southern Logan County. His grave is topped by a life-sized statue of himself made of Italian marble. Levicy outlived her husband by eight years. Her great nephew was the infamous anti coal Miners Union/Political boss Sheriff Don Chafin. Hatfield was portrayed by actor Kevin Costner in the miniseries Hatfields & McCoys. For his role, Costner won both the Emmy and Golden Globe for Best Actor in a Leading Role in a Miniseries or TV Movie. ^ a b Alther, Lisa (2012). Blood Feud: The Hatfields and the McCoys: The Epic Story of Murder and Vengeance. Globe Pequot. ISBN 0762785349. ^ Lively, Mathew W. (March 25, 2013). "Devil Anse Hatfield Fights His First Border War". Civil War Profiles. Retrieved December 20, 2015. ^ Blitz, Matt (December 29, 2014). 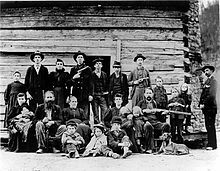 "THE REAL FEUD BETWEEN THE HATFIELDS AND MCCOYS". Today I Found Out. ^ History.com. "The Hatfield and McCoy Feud". Retrieved October 24, 2013. ^ McKim, Sean. "Anderson "Devil Anse" Hatfield". Find A Grave, Inc. Retrieved May 30, 2012. ^ "Hatfields & McCoys | Television Academy". Emmys.com. January 14, 2013. Retrieved March 24, 2017. This page was last edited on 24 March 2019, at 04:20 (UTC).